A year ago I responded on Twitter to a hashtag, #NotOK, created by author Kelly Oxford, and spoke publicly about the sexual trauma I’d experienced in the years before I turned 21. Although I’d started to share my experience privately, and in trauma therapy, I’d never revealed myself as one of the far too many people who’ve experienced sexual trauma. That moment became a turning point and I began sharing more often, publicly, about my journey with Complex PTSD, my history of sexual trauma and the abuse I experienced from my Mother throughout my life, into my mid-40s. Last week, while on retreat, I had the pleasure of sitting down with my dear friend, artist Sarah Jane, to create my “portrait” for the participatory art project she created to honor those who have experienced sexual violence, Mere Objects. I was honored to be part of some early discussions she began as she considered how to turn her ideas into an ever-growing art installation. I’m thrilled that this project will have it’s first exhibition in November 2017. All of the portraits submitted to the project are anonymously given and nothing revealing is shared. Participants send objects to a post office box with a small note to introduce their portrait for the installation. Portrait objects are put into small glass bubbles which are hung using ball chain. People viewing the installation will be able to walk under these portraits. Sarah Jane strives to make sure that all participants will feel safe sharing their experience with sexual trauma. I’m choosing to break my own anonymity so I can share this part of my healing journey. Sexual trauma is a big part of my story and is one of the dangerous undercurrents of shame that has shaped me. I first experienced sexual trauma at age 7. I experienced several more instances, a total of 4 different male abuses, all before my 21st birthday. All of these men were known to me. I trusted them. I was engaged to marry one of them until he raped me. Most painfully, but also most necessary, has been naming the unease I felt throughout my adolescence, until I gained a significant amount of weight in my 20s, as coming from the sexual grooming that was part of my Mother’s abuse. My relationship with Sarah Jane as a friend, artist, and co-creator, and my participation in Mere Objects has helped me to name this abuse which has felt particularly shameful, so much so that I only have just spoke about it in the past two years of my 48 years. I lived under the family code, “Don’t air the family’s dirty laundry in public.”, code for the usual message in abusive families, “Don’t tell. Keep your mouth shut.” Through sharing my story I’m breaking the silence that helped keep me mired in shame. I’m letting my whole self, light and dark, be seen. Making my portrait, with Sarah Jane’s coaching, felt like the right decision for so many reasons and I was glad I’d held off mailing my objects. It was deeply healing to help place all the items in a tiny bubble of glass. 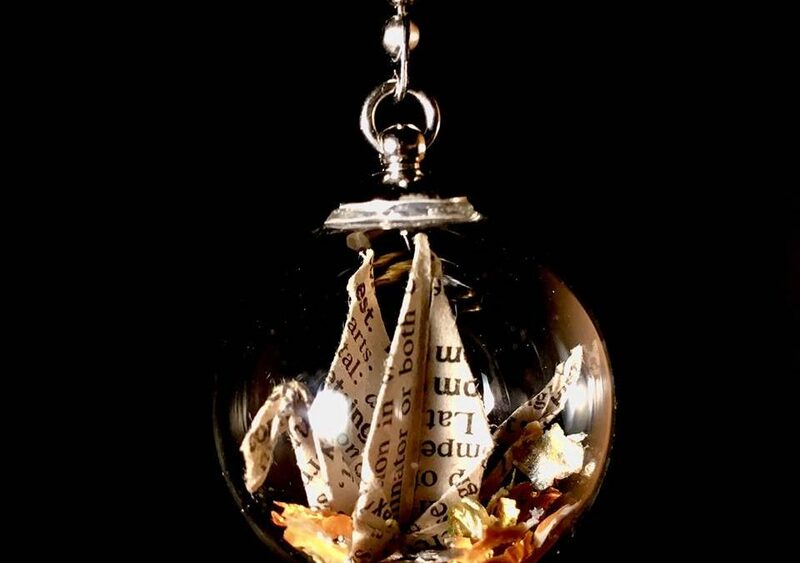 I’d practiced folding my origami crane tightly in half, the soft dictionary paper allowing it to carefully slip it into the top of the bubble. I was thrilled when it popped back open quickly. We used toothpicks to help open up the wings of the tiny crane. Sarah Jane showed me how she uses tweezers to put tiny items into the bubble; I had silver and gold “treasure” for the crane to sit on. I was fascinated watching her cap the jar so it can be hung, setting everything, and polishing the glass back up before taking a series of photographs and video. Her photo is the one for this post. I was delighted when Sarah Jane found the glass bubbles for the portraits; I still find great joy and peace in blowing bubbles. After she finished my bubble I had the opportunity to sit and hold portraits from other people who’d shared their story and objects with the project. I felt so much love for all these people, some of whom had never shared their experience before now. Holding their tiny portraits felt like such a precious gift, a deep honoring, I sent love outwards to all people who’ve experienced sexual trauma and offered to help hold the burden of silence they’ve carried. If you would like to participate in Mere Objects, you can send your objects anonymously to the post office box for the project. An origami crane made from a piece of old dictionary paper with the definition of the word “complete. Origami cranes have been precious to me of many years. For me they symbolize love, liberation, and my hope for peace for all who’ve experienced sexual trauma. Dictionaries helped me understand language better as a child, I chose to use a piece of one with the definition for the word “complete”, a reminder that we’re all whole and complete, lacking nothing, worthy just as we are. “Treasure” for the crane to nest on. I love the line in Mary Oliver’s poem “The Buddha’s Last Instruction” about “…turning into something of inexplicable value.”, it helps me to remember that my experiences of sexual trauma did not stain me, have not broken me, All beings are of inexplicable value in this world. I hit upon the idea of honoring my new journey as an artist and symbolizing that sense of value by using flecks of dry, silver & gold acrylic paint; treasure.